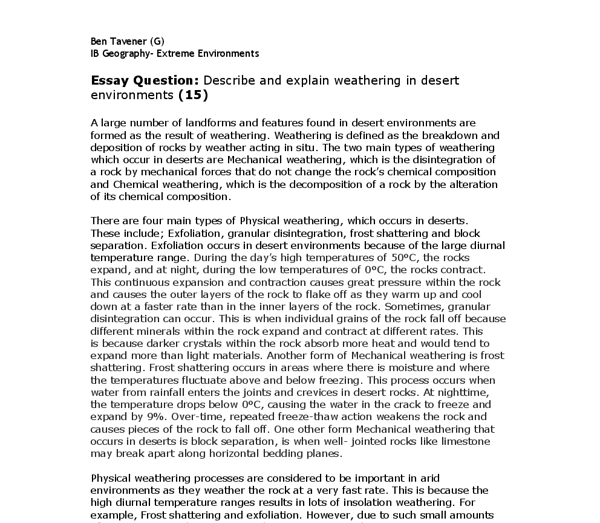 ï»¿Ben Tavener (G) IB Geography- Extreme Environments Essay Question: Describe and explain weathering in desert environments (15) A large number of landforms and features found in desert environments are formed as the result of weathering. Weathering is defined as the breakdown and deposition of rocks by weather acting in situ. The two main types of weathering which occur in deserts are Mechanical weathering, which is the disintegration of a rock by mechanical forces that do not change the rock’s chemical composition and Chemical weathering, which is the decomposition of a rock by the alteration of its chemical composition. There are four main types of Physical weathering, which occurs in deserts. These include; Exfoliation, granular disintegration, frost shattering and block separation. Exfoliation occurs in desert environments because of the large diurnal temperature range. During the day’s high temperatures of 50°C, the rocks expand, and at night, during the low temperatures of 0°C, the rocks contract. This continuous expansion and contraction causes great pressure within the rock and causes the outer layers of the rock to flake off as they warm up and cool down at a faster rate than in the inner layers of the rock. ...read more. For example, Frost shattering and exfoliation. However, due to such small amounts of precipitation in deserts, Frost Shattering is not such an important process in deserts as Exfoliation and Block separation. 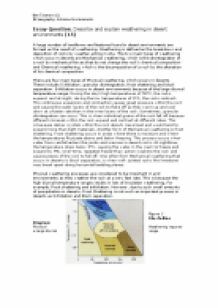 Figure 1: The Peltier Diagram Physical Weathering requires a large diurnal range. There are also three main types of Chemical weathering that occur in desert environments. These include; Salt crystallization, Hydrolysis and the processes that form duri-crusts and desert varnish. The main type of chemical weathering found working in desert environments is salt crystallization. This is the process of breaking down rocks by the growth of salt crystals in cracks. Salt crystallization is caused by saline water, which comes from rainfall or from the groundwater that is drawn up to the desert surface by evaporation. This saline water then enters into pores or cracks in the desert rocks. The high temperature in hot deserts causes the water to evaporate, forming salt crystals. As the salt crystals form they expand, exerting pressure on the rocks. As more evaporation occurs, the salt crystals expand even more. ...read more. This is because most forms of chemical weathering require moisture and water and as deserts have very small amounts of precipitation, there is no water to create chemical reactions. However, More recently geologists have come to accept that chemical weathering is becoming increasingly recognized in deserts. This is because that it has been found that deserts have high relative humidity levels at night-time and in the form of due, water is present for chemical processes, such as hydrolysis. Also, forms of chemical weathering, such as salt Crystallization occur as there are very high rates of evapo-transpiration, due to the high temperatures found in hot deserts. Finally, weathering in deserts also depends on what type of desert it is. For example, In Reg and Hamada deserts, which are stony and rocky, most of the weathering tends to be physical. For example, disintegration due to granular disintegration or exfoliation. This is as there are lots of rocks, which means that insolation weathering take place. However, despite low levels of precipitation, chemical weathering is noted to be significant too, for example, hydrolysis, which is caused by high levels of moisture at night. Inversely, In Erg deserts, which are very sandy, most of the landforms, like Barchan dunes are formed as a result of deposition, rather than weathering. ...read more. This dry air rises and reaches the outer layer of the atmosphere and now becomes coder and dryer. Because of the rotation of the air the air circulates and moves from the equator to either north south, this cold air is than heated by the sun and gets dryer; this air dries the location and creates the desert environment. PUBLIC CONSULTATION AND FEEDBACK 37. Our Subject Committee found that although the economic reasons for attracting foreign talent are strong, concerns were raised on the possible negative impact that attraction of large numbers of foreign talent might have on Singapore. Site F (see graph 4.5), this happens because Site E had more calm waters than Site F. Also Tambopata river is not included in the pattern of the correlation, this happens because it is another river, from a different source (see map 1.4).